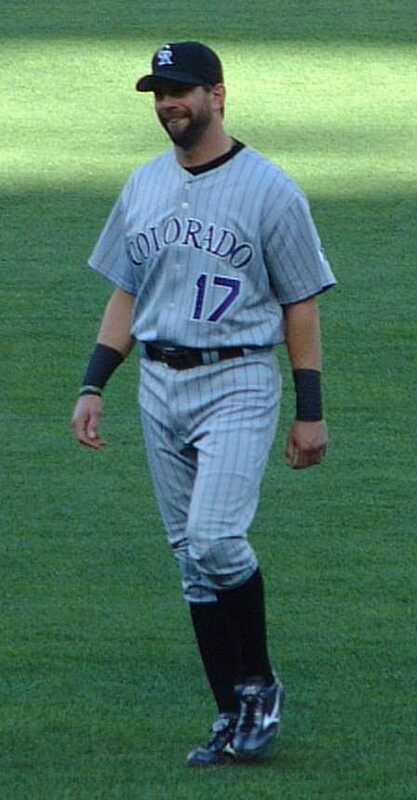 Just when you thought the former Rockies first baseman was done receiving awards, Todd Helton has added another honor to his illustrious career. Fresh off of being named “Tennessean of the Year,” the 17-year pro – all with the Rockies – was inducted into the Colorado Sports Hall of Fame late Thursday night. “I’m very honored that it did happen, especially so quickly after I retired,” Helton said in an interview with WBIR – a CBS affiliate in Knoxville, Tenn. In order to be considered for induction, a candidate must have displayed characteristics of courage, endurance, leadership, power, sacrifice and sportsmanship for their respective Colorado organization. The five-time All-Star had a career batting average of .316, 592 doubles, 369 home runs and a career WAR (wins above replacement) of 61.5. He collected three Gold Gloves and was named a Silver Slugger four times. It was quite a sight when Helton didn’t take the field in Colorado’s Opening Day lineup. This was the first time since 1997 that somebody other than Helton manned the bag. He has enjoyed his well-earned retirement, however. With one Hall of Fame in the books, that leaves the question: How about Cooperstown? If it were up to us Rockies fans, there would be no doubt. What Helton has meant to the organization and how he has handled himself in the community would make him a first-ballot choice. But if it is the numbers you need, then let’s peruse them, shall we? 7 – Only seven others players, besides Helton, own a .316 batting average, .414 on-base percentage and .539 slugging percentage. The others? Jimmie Foxx, Lou Gehrig, Rogers Hornsby, Stan Musial, Albert Pujols, Babe Ruth and Ted Williams. All of them, except for current Los Angeles Angel Pujols, are in the Hall of Fame. 8 – His career batting average of .316 is the eighth-highest for any player since 1946 (minimum 5,000 at-bats). 2 – Helton is the only player not named Stan Musial in Major League history to have 2,500 doubles, 550 doubles, 350 home runs and a batting average over .315. 175 – In a Hall of Fame Monitor, created by Bill James, Helton scored 175 points. The monitor gives points by year-to-year achievements in statistical and award categories. If you score 100, you are normally in the discussion for induction. 130 almost certainly guarantees you Hall of Fame status. Between those numbers and his unprecedented character, Helton should find himself in Cooperstown in the coming years.